Wineries located around certain little towns have started to realize there is a super-additive effect to clustering tasting rooms together. It’s kind of like putting a bunch of car dealerships together ~ draws bigger crowds ~ greater than the sum of the parts. Murphys in Calaveras County is the premier example. They have been doing this very successfully now for at least ten years. The town council is very supportive, and many of the wineries find their whole business is now geared around the particular demands of this ‘downtown tasting room’ model. Visiting winery tasting tooms in town is the simplest part of the weekend. So make your plans around the time you will spend in your car, i.e. coming into town and leaving town. Once in town, park car at your lodgings while you stroll around like the squire of the village: shopping, critiquing art or fashion, and tasting wines. Stay: City Hotel in Columbia State Park. Wild West history and a good meal with great wine list. Visit: Calaveras Big Trees State Park. Visit: New Melones Reservoir. Water sports, fishing. Woman owned winery. Nice grounds, good wines. Visually stunning edifice. Waterfall in the cellar. Gigantic gold nugget. Closed Tues & Wed; open noon to 6:00 Fri, Sat, Sun; by appt Mon & Thurs. At 3,300 ft, noteworthy for elevation. Tasting Room also serves as retail hat shop. Wines are technically well made with an emphasis on Italian varietals. Longest serving tasting room in Murphys has produced a successful business model based on face-to-face sales and wine club. Try PS. Largest winery in town means best wines likely to be found in SF or LA stores and restaurants. Line-up includes cool-climate Pinot Noirs. Physician owners’ business plan has at times seemed akin to a 4-yr-old’sbirthday party, but the Syrah is world-class at a Foothills price point. Spanish variety specialist does really well with red blends. Fun place. Certified organic grapes. Emphasis on Rhônish grape varieties ~ 2nd label (Coppermine) makes Bordeaux varieties. Sophisticated cheese shop in tasting room does California’s best job pairing wines with cheeses. Depending on your accommodations, you may decide on any number of dining arrangements. I count 23 wineries in Calaveras County at the end of 2012. Downtown Murphys has tasting rooms for 18 of them strung out along a single mile of their Main St. I’d call that convenient. It is also very advantageous to other businesses along the central corridor. 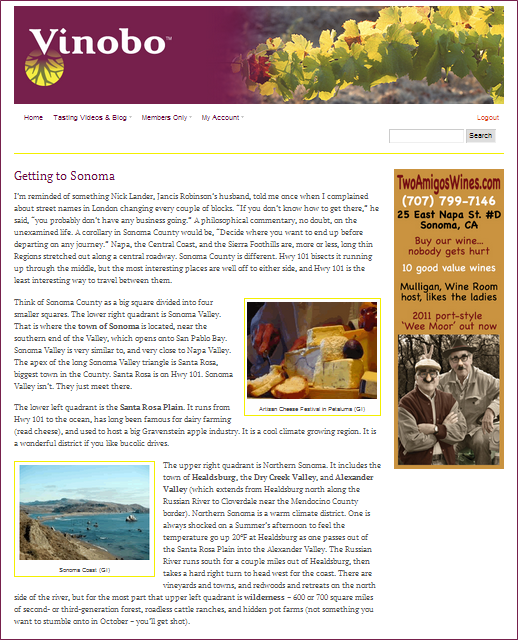 There are a couple Calaveras wineries you want to see who do not have downtown Tasting Rooms. But I’d catch one of those on the way into town, and a second on the way out of town the next day. Stay overnight within a couple blocks of downtown, and make dinner reservations downtown too. This scenario works wonderfully well for a romantic weekend getaway, or for inviting a couple friends to a group holiday. Murphys is the vinous centerpiece of Calaveras County. It is about two-hours-forty-five-minutes from San Francisco without traffic. Two hours from San Jose. It is an hour north of the entrance to Yosemite, and twenty minutes from Calaveras Big Trees State Park, which includes the Northern Grove of Giant Sequoias. The first Giant Sequoia was seen by a Caucasian naturalist here in 1852. Tourists have been coming ever since. The park was established in 1931. Murphys is very close to Angel’s Camp, where the jumping frog contest made famous by Mark Twain is reorganized every year. Mr. Clemens made a lot of things seem much more interesting than they actually are. Sonora, and the restored gold mine town at Columbia State Park have much more interest value. River and reservoir recreation are well developed for those with gear and experience. For those without, look into swimming and/or boat rental at New Melones. Murphys was founded by two brothers who arrived in California in 1844 via the first group to bring wagons across the Sierra Nevada. When the Gold Rush began, nearby claims yielded more than $20 million in gold, which made merchants in Murphys very wealthy. For comparison purposes realize inflation has raised the value of $1 in 1850 to $30 in 2010. To make that comparison more dramatic, if less useful, note as well that gold was selling for nearly 100 times in 2010 what it did in 1850. Like many wood-frame towns of the Gold Rush era, Murphys burned to the ground more than once. Nevertheless, the Murphys Hotel is one of the oldest continuously operating hotels in California. The town also has an active chapter of E Clampus Vitus, a fraternal drinking society loosely associated with the mining industry. The clampers built a Hall of Comparative Ovations in town. The biggest nearby winery is Kautz Ironstone. John Kautz was Sect. of Agriculture in California from 1995 to 2002. His winery is akin to the Winchester Mystery House. In the mid-1990s Kautz built a kitchen capable of serving 1,500 meals. At the time there were fewer than 60 hotel rooms in Murphys. Kautz proceeded to hold concerts with headliners such as ZZ.Top, Chris Isaak, Carrie Underwood, Faith Hill, Cold Play, and B.B. King. There were only 2,000 citizens in town.